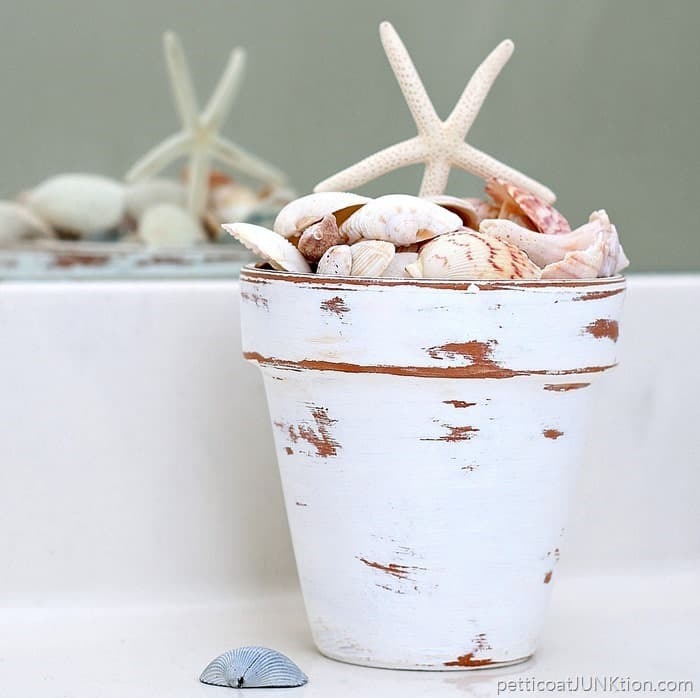 This distressed white terra cotta clay pot is perfect for showing off your seashell stash or of course you could always use it as a flower pot. The project is so easy……5 minute flip. 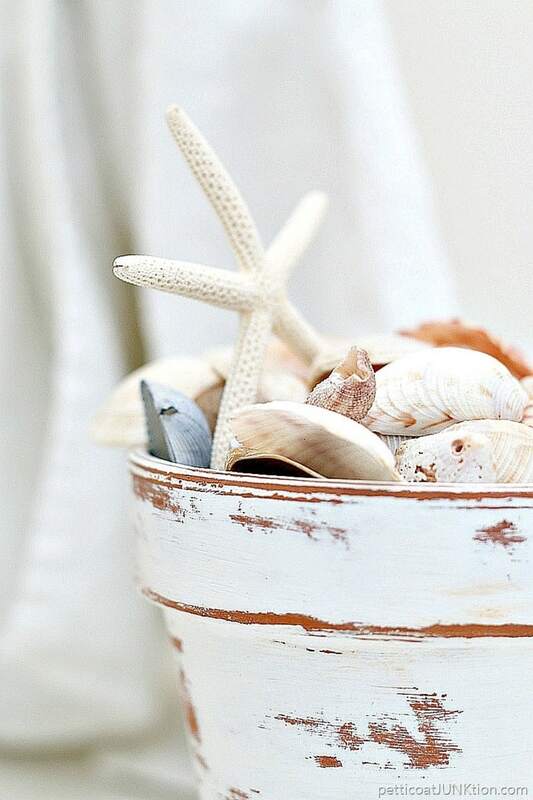 Is there anything prettier than white distressed paint? I don’t think so. If you agree with me this project is definitely for you. If you don’t agree please leave a comment and tell me your favorite paint color or paint technique. This project makes me smile. I know you guys here that a lot from me. You probably think I have a permanent smile on my face. Maybe. The clay pot was in my stash. It looks like it’s seen better days. I don’t even know where I got it or how long it’s been hangin’ out in the shop. 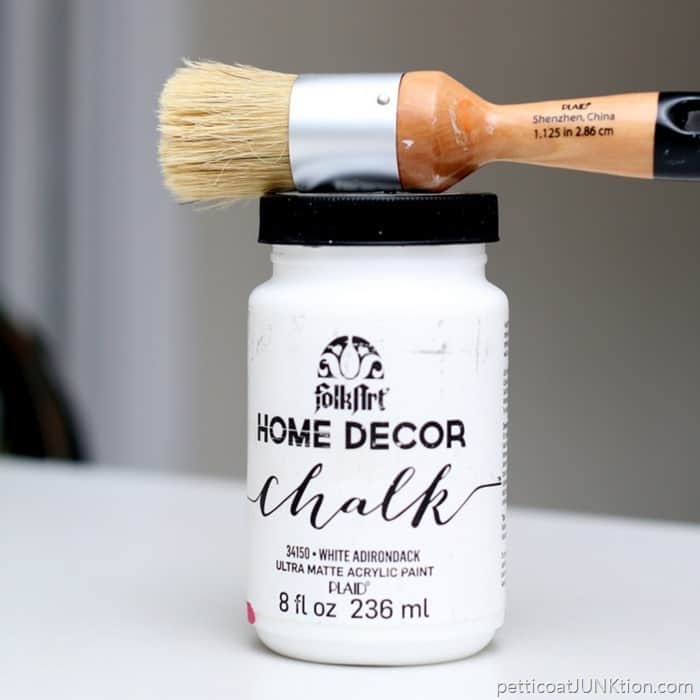 I pulled out my favorite matte paint, FolkArt Home Décor Chalk, color White Adirondack. I applied one coat of paint and the coverage was great. Then I applied one more coat. 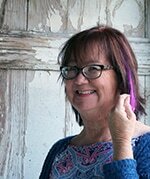 I love the chalk paint brushes. I don’t know what is different about them I just know the paint loads well and goes on smooth. 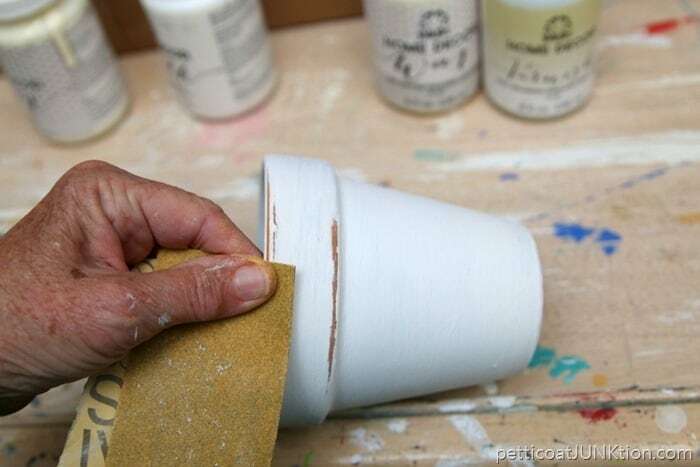 Once the paint was dry I pulled out a piece of sandpaper and went to work. I started with the rim and the sharp edges. Then I went for the body. The paint was hard to remove. Maybe because the clay is really porous and soaked up the paint?? Once the distressing was done that was it. I didn’t apply wax or a sealer because I’m in love with the matte finish. Did I mention how quick you can do this project? Really Quick. 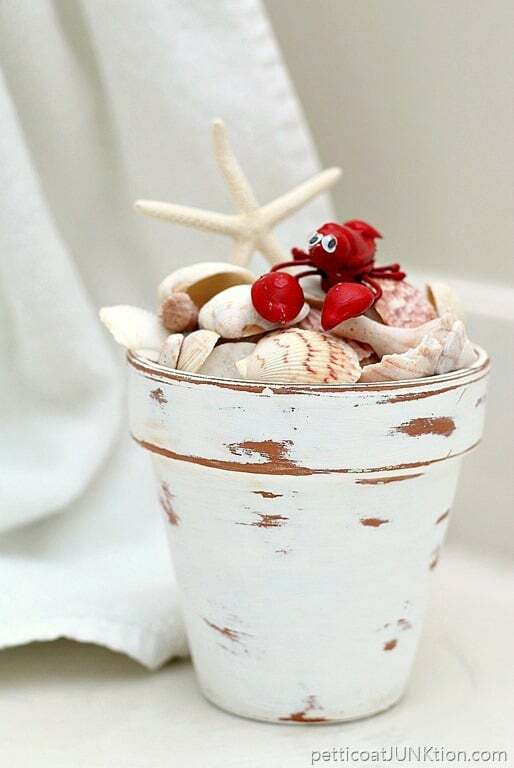 I filled the pot with seashells and…..Red, the Maine lobster ( a vacation treasure from a few years ago). What’s not to love! 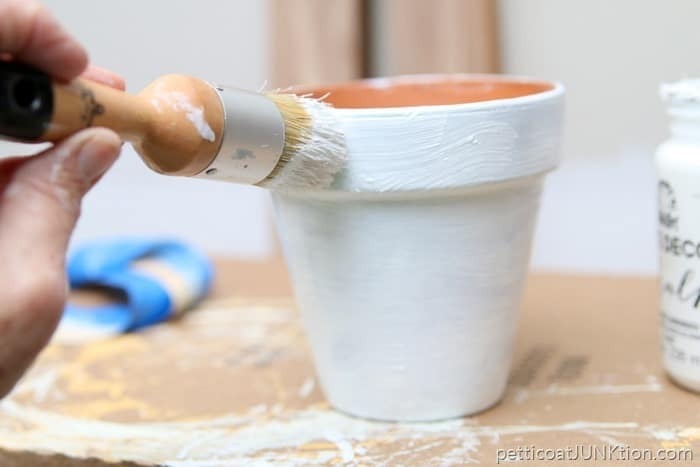 This is a video tutorial I put together on how to distress furniture and home decor….very short…...by me!…..
Maybe the reason the distressed paint works so well is the combination of white and terra cotta? Thoughts anyone? Have a great day and I’ll see you tomorrow. Thanks for being here (insert Kathy smiley face). 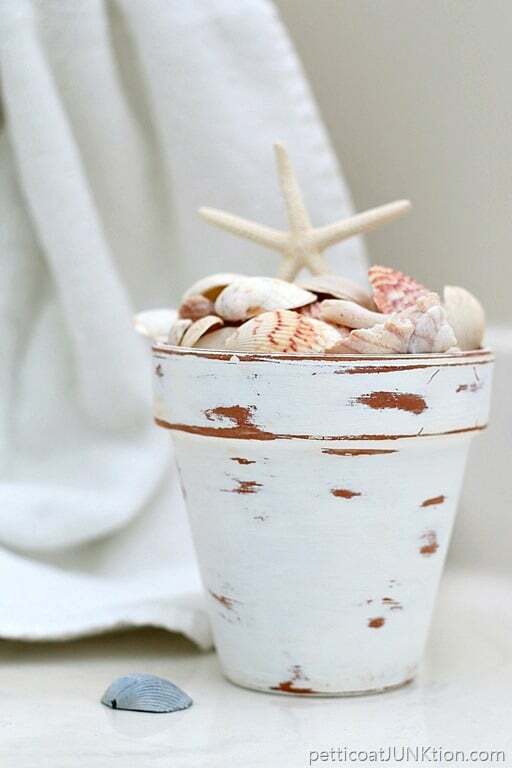 Love your white clay pot, lots of nice distressing, just right Happen to have some of that while chalk paint so will give it a good old try, put some of my shells in it. Why didn’t I keep those shells I used to collect at beaches in San Diego? 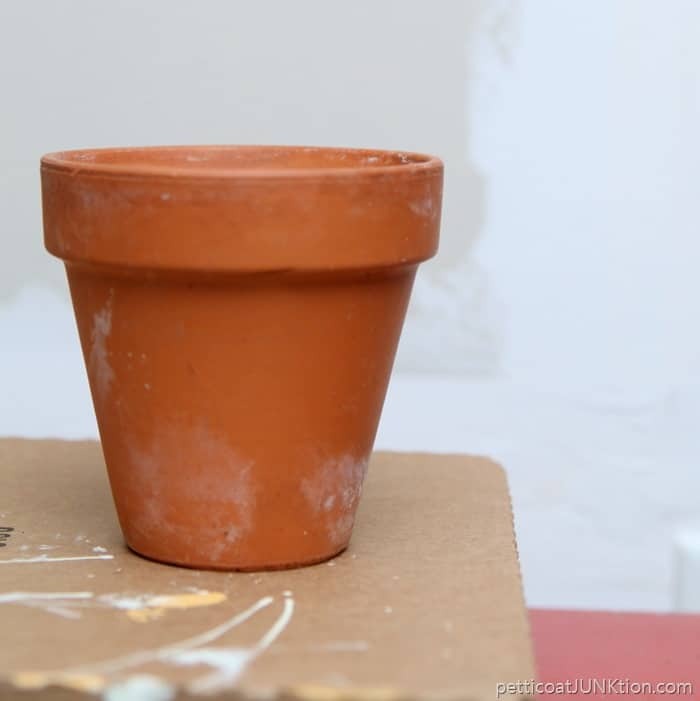 Now where is my clay pot? Your pot looks wonderful. I have another idea. How about put any old rocks in the bottom to weight it, then some kind of filler (newspaper or packing peanuts), then put shells in the top couple of inches. I would hate to have so many beautiful shells where they can’t be seen! We have scads of shells. Finally, we got them altogether in one spot. I don’t know what we will do with ALL of them, but this sounds like a great idea for SOME! We live close to the Atlantic in southeastern NC. We have no REASON to pick up more, but we do. Perhaps we’ll go through our hoard and give some away. Yeah, I like it. Simple and quick, that’s right up my alley! I have quite a few clay pots which I love, but I think I might love one or two even more if I painted and distressed them. Thanks for the idea! That is so pretty. I think that hens and chickens succulents would look fantastic in one of those pots! Love it! My clay pots are about to get a face lift!! Thank you! Love it. 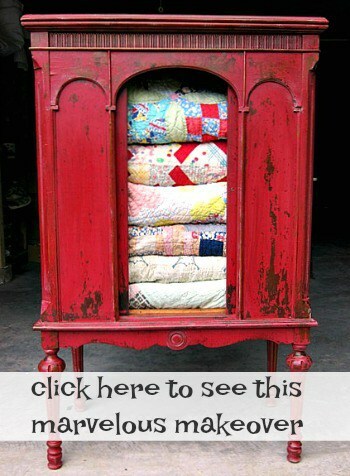 Isn’t it great that something so easy and simple turns out to be the perfect addition to perk up indoor or out decor.